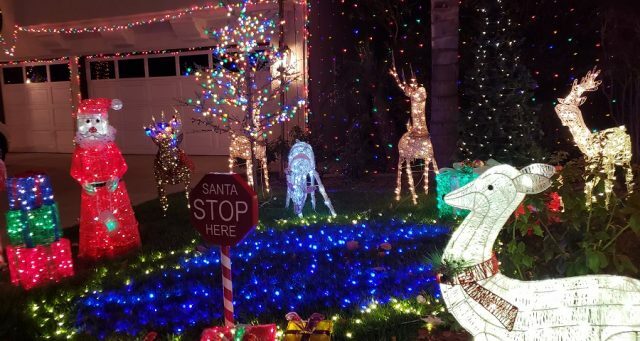 Moorpark Lit Up — Candy Cane Lane is Aglow! We have family members who have recently relocated from the Santa Rosa Valley to Moorpark. 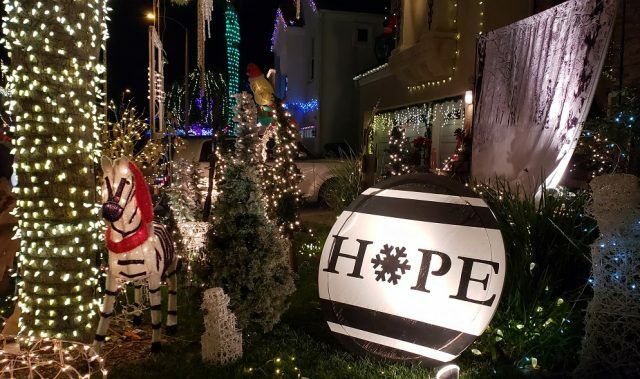 Little did they know they bought their dream home in the middle of Moorpark’s “Candy Cane Lane.” They got an inkling that their move may have brought them into the hub of the holiday celebrations for this Southern Californian burg when they ran out of candy at 7PM on Halloween. 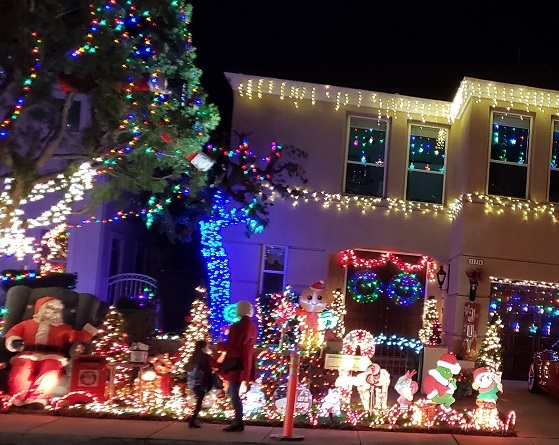 Their new neighborhood decks the halls and their homes for the holidays, and none more so than at the Christmas season. 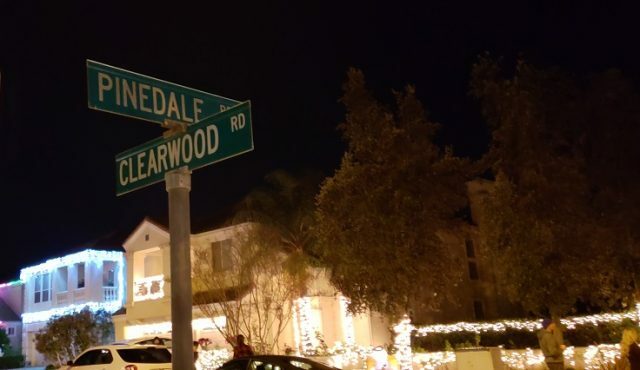 Pinedale and Clearwood Roads has been the spot to see local flashy sparkle and splash for the past 25 years in Moorpark. 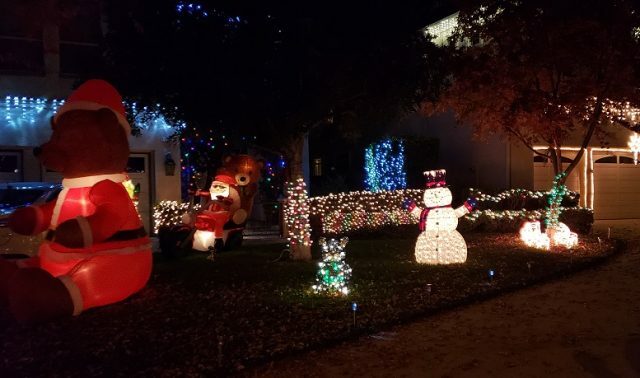 Most of the homes dressed up for the season stick to themes. Santa is very big as well as reindeer, angels, bears, snowmen and glittering trees. A few give witness to current culture such as Star Wars and even old favorites like the Grinch. Others are so crammed full they look at as if the homeowner raided the clearance bins of the local hardware store. 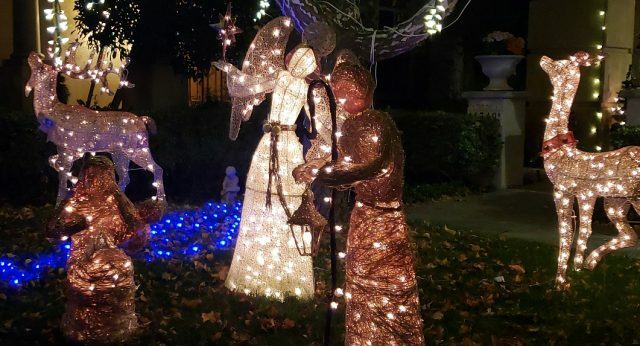 One house posted the times for Christmas Eve Services at Cornerstone Church, the reason for the season after all. 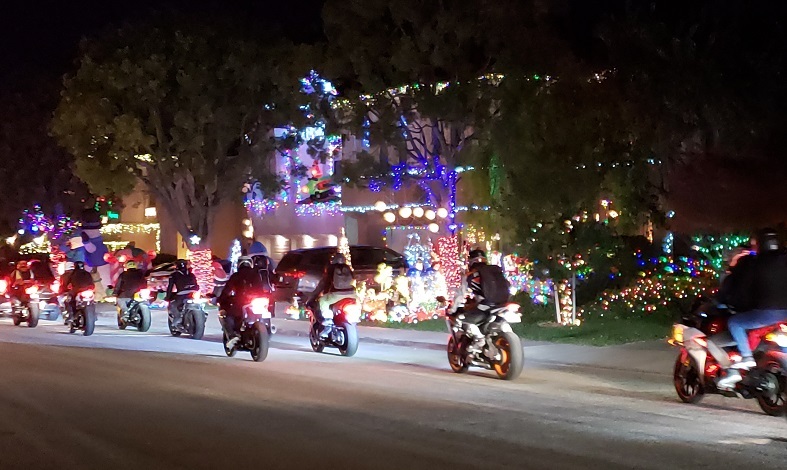 No matter, the overall effect is wholesome family fun, even for a motorcycle club who happened to buzz through the neighborhood while we were there visiting. If you want to see it come by before January 2nd. 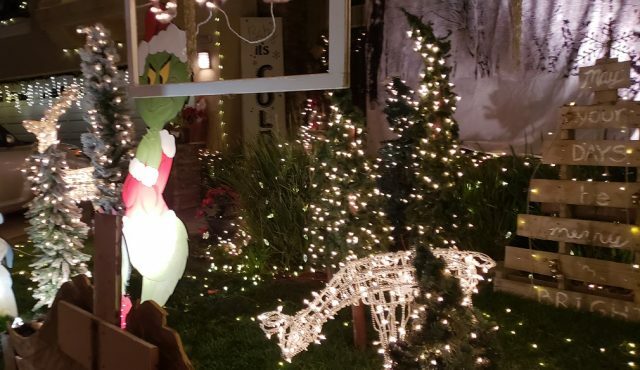 After that Candy Cane Lane will go dark as the lights and adornments are put away for next year’s holiday season. Debra Tash is Editor-in-Chief of Citizensjournal.us, past president for Citizens Alliance for Property Rights, business executive and award-winning author, residing in Somis. 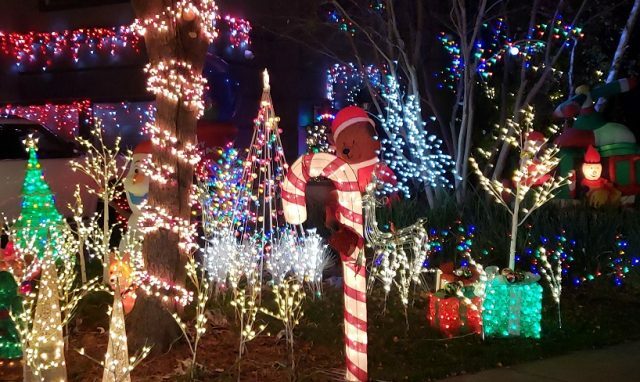 6 Responses to Moorpark Lit Up — Candy Cane Lane is Aglow! 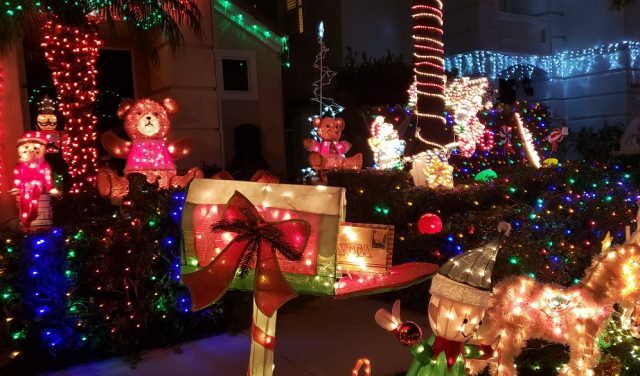 Debra, do you know when the next lights in 2019 will be ready for viewing? After Thanksgiving? December 1? 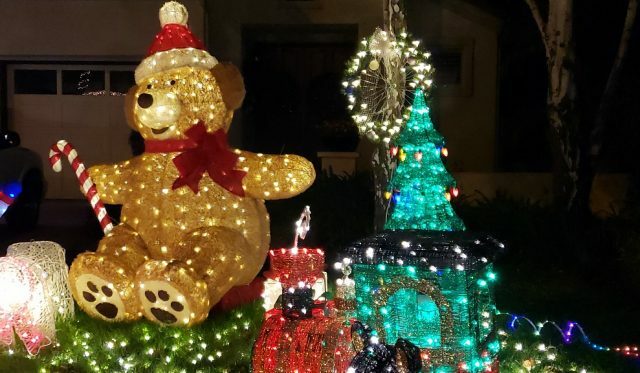 I have several young grandchildren who come to visit us for Thanksgiving every year, and they would love to see the lights, but I don’t know when they will begin in 2019? If you could let me know, I would really appreciate it. We always book their airline tickets months before Thanksgiving to get good prices on the flights. 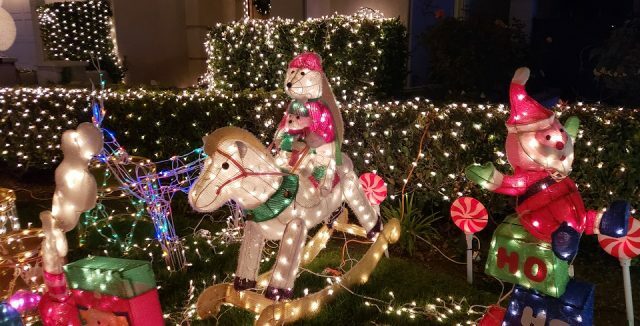 So if I know when the light show starts in 2019, I might be able to have them stay a day or two longer to be able to see Candy Cane Lane. Thank you so much in advance for your reply and hopefully helpful information! It usually goes up after Thanksgiving. It’s done by private property owners so it varies. But a few weeks after Thanksgiving should be a sure bet. I’ve heard there are horse drawn carriage rides also? If so, do you know what company is used and can you book in advance? Can you walk this or is drive-by only? You can walk it. It’s very nice and great to see it.